Athens, Greece, 6 May 2016. 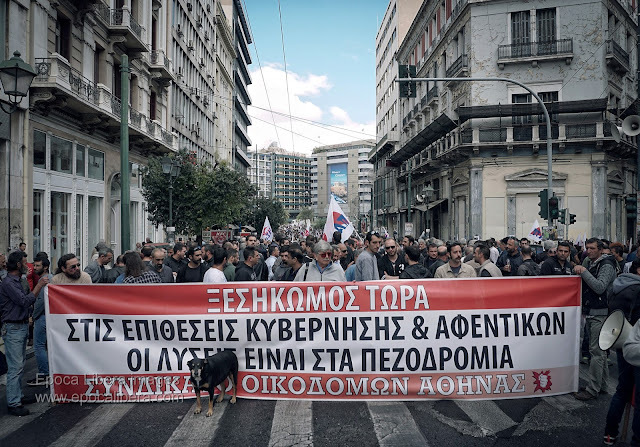 Workers across Greece have begun a three-day strike in protest against new tax increases and pension cuts, that are being proposed by SYRIZA government in return for more bailout money. 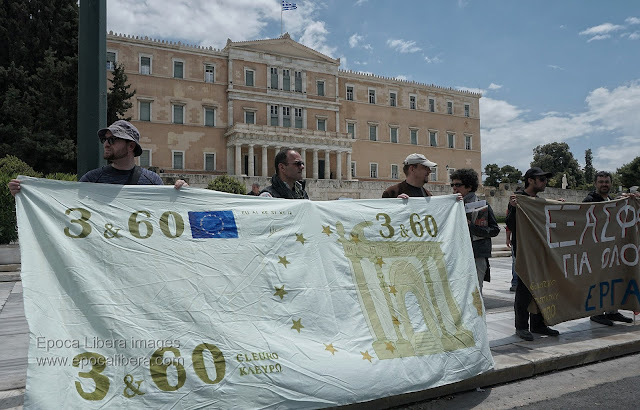 It is the 12th round of austerity measures introduced since Greece signed up to a series of rescue deals with international creditors in 2010. 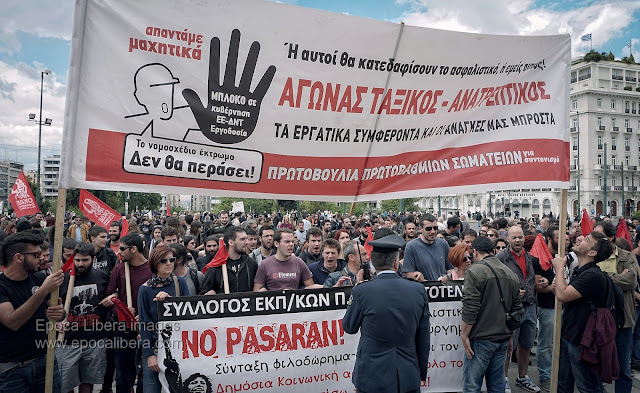 Thousands of protesters from communist-affiliated union PAME - KKE marched to Syntagma square on Friday morning chanting slogans against controversial government plans to overhaul pensions and increase taxes to meet demands of its bailout creditors. Public sector workers union ADEDY held also another massive protest rally on Friday noon. Protesters marched before parliament holding banners that read: "No Pasaran". Called by the largest private and public sector unions GSEE and ADEDY, the general strike left ships docked at ports and disrupted public transport across the country. Civil servants closed government offices while television news programs, are cancelled or disrupted, in a sign of growing discontent with Prime Minister Alexis Tsipras' left-wing government. More protest marches of Trade Unions and farmers as well are expected on Saturday and Sunday. Violent arrests and repression of photojournalists in order to prevent them from capturing the beatings of riot police. This happened after the end of the demonstration in Syntagma square ahead of the Greek parliament in protest of further austerity. Athens, Greece, 8 May 2016. Βίαιες προσαγωγές (που μετατράπηκαν σε συλλήψεις) και απώθηση φωτορεπόρτερ για να μην καταγραφούν ξυλοδαρμοί των ΜΑΤ μετά την διαδήλωση στο Σύνταγμα για το ασφαλιστικό - φορολογικό (οδός Μπενάκη στα Εξάρχεια). Στο 00:54 ακούγεται ήχος από χτύπημα και αμέσως μετά στο 00:55 ο κρατούμενος που τον έχουν ακινητοποιημένο, ακούγεται να φωνάζει σε βοήθεια: "Μας χτυπάνε". 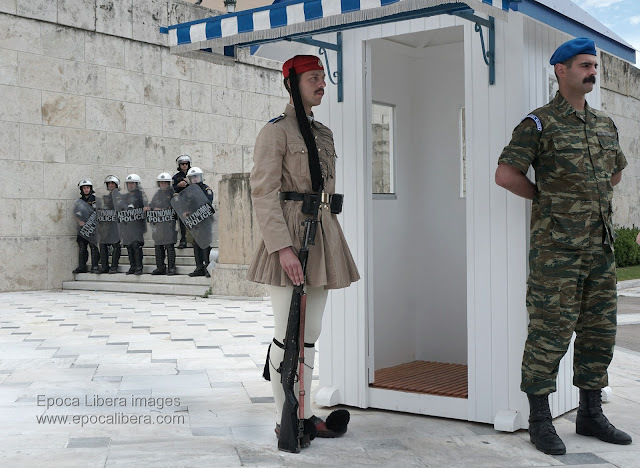 Αθήνα 8 Μάη 2016.